Amsterdam has ca 600 km of canals and 1600 bridges. It's estimated that some 200 km of the canal walls need renovating together with numerous bridges with a rough cost estimate of tens of millions of Euros - and this is only the current analysis. The standard reconstruction or renovation involves pressing in sheet piles without vibration or noise. Beens Groep have been using Kowan Still Workers (supplied by Watson & Hillhouse and our Benelux Agent, Richardson Piling Solutions) to press in sheet piles in the Oudegracht in Utrecht to the satisfaction of most, if not all, neighbours. 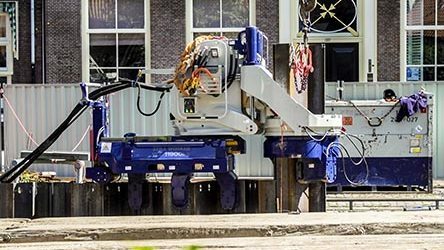 The Still Worker’s unique and exclusive mast tilt/self-levelling device, makes it a very efficient pressing machine, in addition the ZU-100 is light and compact which was perfect for the very tight access and weight constraints along the canal. The success of works in Utrecht has led to further inner city canal projects such as the work on the Delftes Schie. 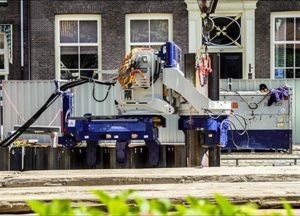 Van ‘t Hek who also invested in a new ZU-100 have been using their machine both in Utrecht and Amsterdam.